A couple of years back I had tickets to the theatre to see Hairspray with a few of my girly mates. Before the show started I suggested we try something different in terms of food. Inamo Restaurant was the chosen venue in Soho, Wardour Street. Not sure what I was expecting, I was greeted by the waiter who showed me to my table (I was the last to arrive), or should I say to my interactive menu board. This Japanese restaurant certainly differentiates from other Japanese restaurants, it is very quirky. Once sat down, on the bottom right hand corner of your table setting you see a control to activate your interactive menu, there is no training on how to use it, you are left on your own to order, although this was fun it could also be disastrous. I managed to order myself a drink and after looking through the menu I went for the set vegetarian bento box which was around £8.50. 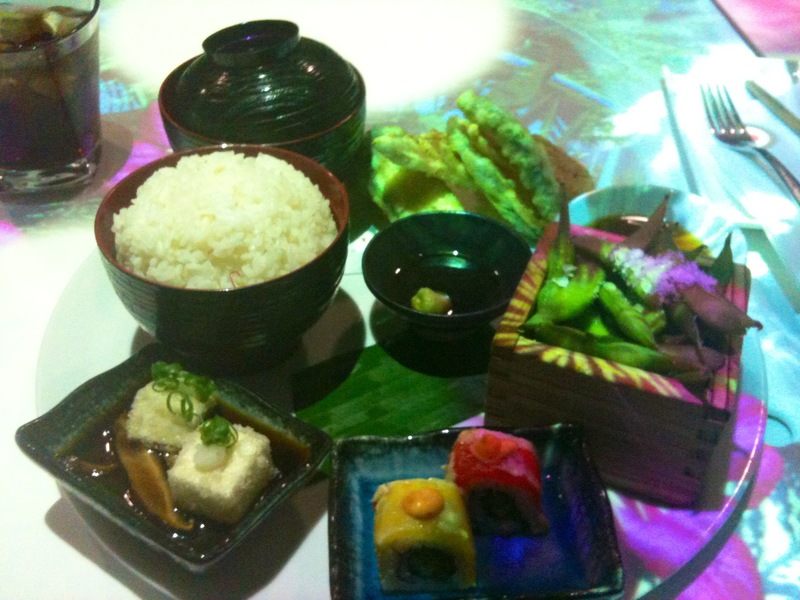 This included mixed pickled vegetables, tofu, miso soup, edamame beans, rice and vegetarian sashimi. Apart from ordering your food from the interactive menu you are able to customise your place setting with a range of themes (some may turn you off whilst eating), there is a live webcam of the kitchen and also the ability to play games. I’m not sure if I or the girls actually talked much this night but we definitely had things to talk about after. There is variety in the menu, it may be slightly on the pricey end, but worth visiting Inamo even if it means stepping into the future for the next 60 mins or so, either way it’s makes a cool venue for a date!